HelloFresh, the world’s leading meal kit delivery company, has launched 20-Minute Meals geared towards getting delicious meals, with minimal clean-up, on the table faster than ever before. The launch of 20-Minute Meals is part of HelloFresh’s continued commitment to evolving their product offerings based on customer feedback. 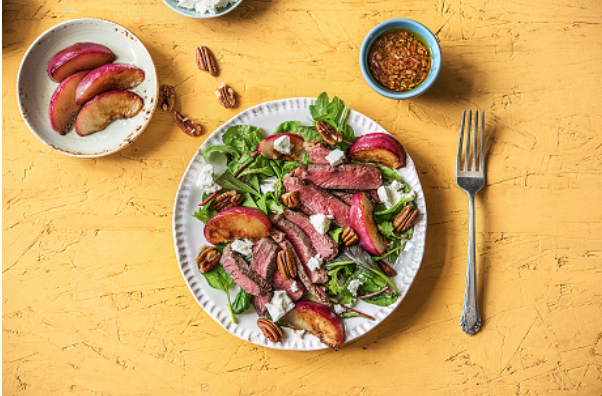 After finding that many customers were interested in having the option for quicker and simpler recipes, in addition to more complex ones, HelloFresh put a focus on how to cut down prep-time, without sacrificing taste or quality. Now customers can cook from home every night, no matter how busy they might be. This offering will exist in addition to HelloFresh’s standard recipes, ultimately giving customers the ability to select recipes with prep-time that best fits their schedule. To achieve this, HelloFresh tapped data and insights which resulted in a final product, some including ready-made sauces, pre-chopped vegetables, and fast-cook ingredients like pre-made rice and fresh pasta. 20-Minute Meals are available to Classic plan subscribers beginning Saturday, September 9. Sample recipes include Steak and Nectarine Salad with Arugula, Pecans, and Feta Cheese; Butternut Squash Agnolotti with Kale in a Sage Brown Butter Sauce; and Sesame Beef Tacos with Quick-Pickled Veggies and Spicy Crema, among others. For more information visit hellofresh.com.